Quinn Devlin & The Bridge Street Kings – "Three Star Cellophane Cocaine Brain"
We’re going to make a bold prediction right now: Quinn Devlin & The Bridge Street Kings will grace the Quad Stage at Newport Folk Festival within five years (and probably less). This collective from New York City is that good. They first caught our attention last October with “Deep In Your Heart,” a classic soul/folk-rock song that echoes Van Morrison back in the ’70s with a touch of Motown for added funkiness. Brilliant was a word we used repeatedly to describe the song. This same adjective fits their new single, “Three Star Cellophane Cocaine Brain,” which we are pleased to premiere today. Like their previous single, “Three Star Cellophane Cocaine Brain” is an instant classic. It resonates with the smooth big band, folk-rock of Van Morrison. The horns bellow gracefully while the guitar and organ chime sweetly in the background, and the rhythms are like love taps on your shoulder. Quinn Devlin’s songwriting, meanwhile, approaches Bob Dylan’s masterful levels. The story is terrific, as Devlin through his gravelly vocals describes the exploits and downfall of a young woman who could have been a star. Instead, she becomes a victim of her success. The song, however, isn’t about one woman’s journey. She is just a representation, a microcosm of the ills in our society. 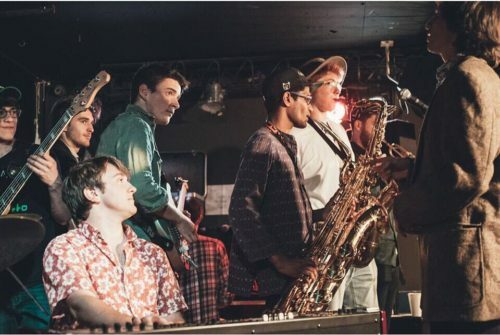 Quinn Devlin & The Bridge Street Kings are: Quinn Devlin (lead vocals), Nick Kirsch (piano), Dylan DeFeo (organ), Zach Calluori (guitar), James Wyatt Woodall (guitar), Andy Shimm (bass), Graham Jacobson (alto sax), Eli Aleinikoff (tenor saxophone), Siddhu Anandalingam (bari saxophone), and Lucas Zabotin (drums). The collective also includes 12 other musicians who perform at any given time. They include: Steve Griffin (guitar), Scott Lowery (organ/piano), Rachel Berman (tenor saxophone), Maurice Marion (flute), Casey Adams (drums), Andy Arditi (tenor saxophone), DK Guo (trumpet), Maia Claman (tenor saxophone), David Acevado (trumpet), Cassidy Jameson (vocals), Natalie Burgos (vocals), and Larkspur Gunther (vocals).